Seqonomics: Which is the best 'ome of them all? Which is the best 'ome of them all? The victory of the genome is of course a foregone conclusion. 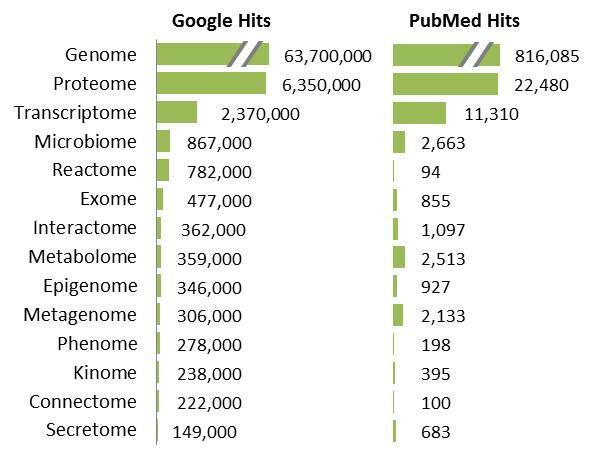 Besides that, it's surprising that the reactome gets so many Google hits, although a PubMed search returns less than a hundred publications containing the term. I might compile the same figure in a year or so to see if the ranking has changed. 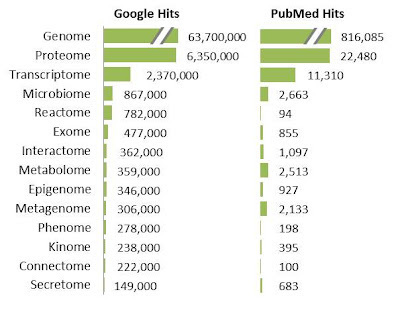 In the meantime, have a look here for a critique of 'omics that goes a bit deeper. I'm so sad "famomics" didn't make the list...never underestimate the power of family history! once again an interesting compilation. What would be even more representative is to add the time. For instance the "genome" word appeared much earlier than epigenome. This could give trend and, in turn, be use as a good speculative projection tool. I suspect that microbiome, metabolome, and metagenome will have pretty strong positive slope.